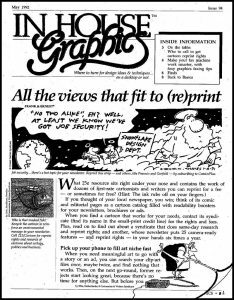 Cartoon reprint costs are another important topic for cartoonists and image licensees to keep in mind. I’ve talked about pricing cartoons and how licensing fees are determined in various forums and in discussions on my cartoonist group on LinkedIn. 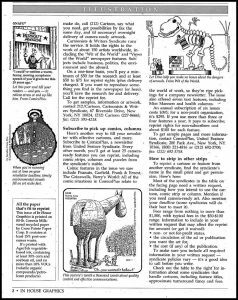 I felt it a good time to reiterate some points again, after recently discovering an old In House Graphics newsletter story on how most big syndicates and licensing agencies formulated their costs. 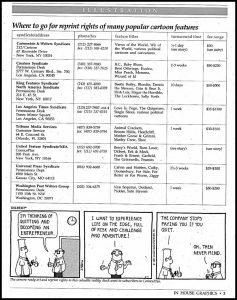 The pricing chart in this post is relatively antiquated since it’s from 1992 – long before the explosion of information online came along. But it provides a glimpse into “flat fees” and high costs based on the non exclusive use of cartoons and comic strips. I say the fees are antiquated since there was less competition from there being no internet available or very little who used the web at that time. Now large stock sites and licensing databases permeate the internet. Self syndicators and those cartoonists such as myself are left to negotiate our own usage and licensing fees based on past experience. I felt it best to share this information so those who purchase or are interested in licensing cartoons from myself or other resources can get a basic understanding on rates. Even with so many licensors now making their presence available online, pricing is not uniform. That is because of so many other factors such as inventory. Many big sites like Getty can afford to give images away for free because they have hundreds of thousands of images already available. The single cartoon licensing agency cannot afford “free”. Hours and hours of time are spent in creating, archiving and ultimately publishing work and making that work available to potential clients. I am not sharing my platform with hundred or thousands of others, so I need to keep fees in mind when an inquiry is made about using one of my cartoons. I also base my pricing on past experience on what other users were willing to pay (according to their budget) and then how that same image was used (usage: another important factor when formulating a fee). 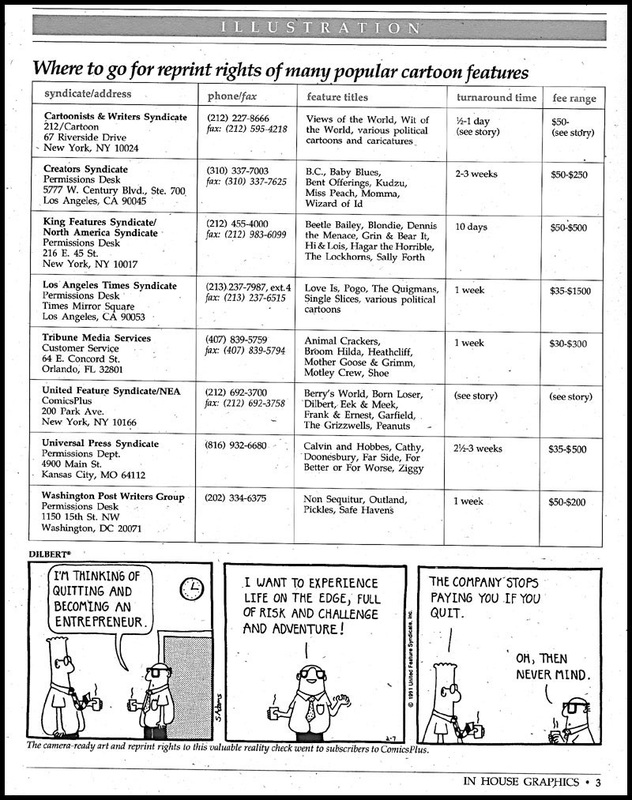 As you might see by this old pricing chart I acquired many years ago, syndicates were charging competitive fee for reprinting the work of their cartoonists. If anything, I find it very interesting and years ago I used this information for my own guideline at that time, and it was very useful. Naturally a small community based web site will have little to no budget for using one of your cartoons as opposed to a corporation website that has 500, 1000 or more employees. When it comes to cartoon reprint costs, you’ll need to ask questions, that’s imperative and consider those two most basic I’ve highlighted in red. 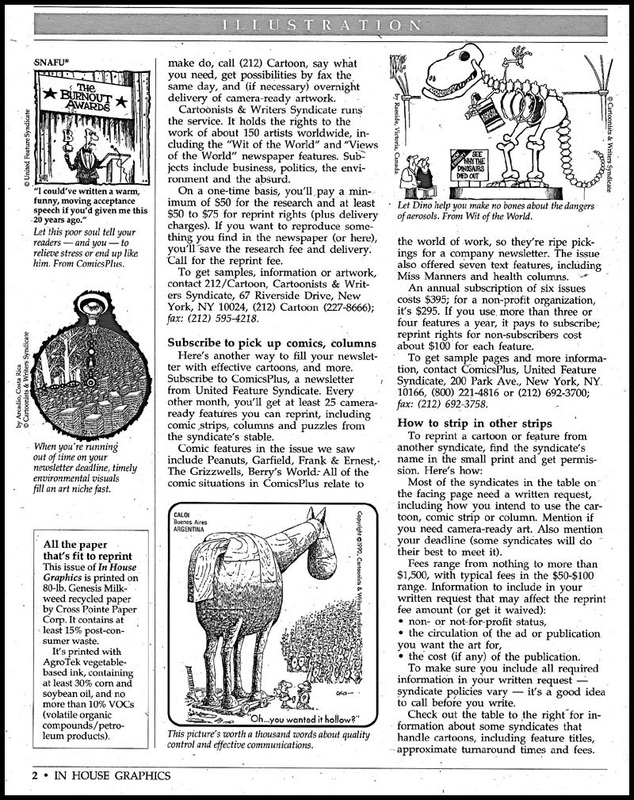 This same information can be for anyone who might want to license the work of a cartoonist whose work they find online. Let the artist know your budget, how you’ll use that image and even your deadline if that is important. Communication is key! 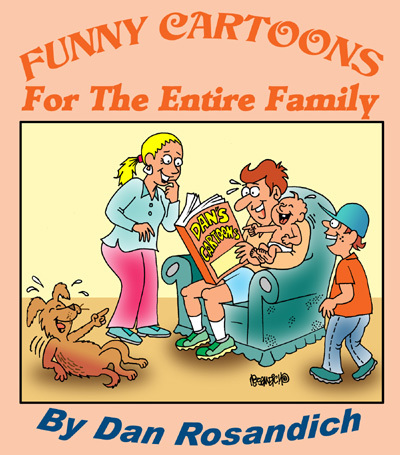 My cartoons can be licensed in many ways and I provide that information on the sidebar of my page here. If you’re a consultant, editor, author, writer or web designer then contact me with specific questions about rates or fees at any time! Additional information on various factors regarding how licensing fees for using cartoons is determined.